Counterweight 11,7 tonnes, consisting of various sections. Hydraulic removal system. Engine Mercedes-Benz OM 904 LA, diesel, 4 cylinders, water cooled, turbocharged, 110 kW (149 HP) at 2200 rpm. (80/1269 EWG - fan rigid). Max. torque : 580 Nm at 1200-1600 rpm. Fuel tank capacity : 185 l. Engine emission : EUROMOT / EPA / CARB (non-road). Optional equipment • Bi-fold swingaway, 10/17 m with hydraulic offset and luffing under load (0°-40°),controlled from the crane cab. 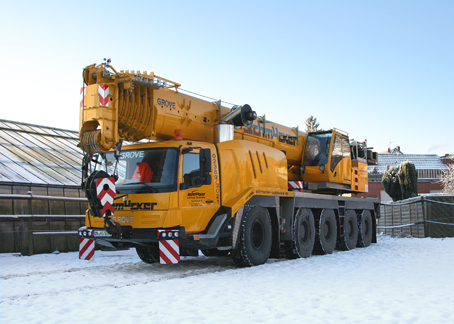 • Additional 15,4 tonnes counterweight (total counterweight 27,1 tonnes). Engine Mercedes-Benz OM 502 LA, diesel, 8 cylinders, water cooled, turbocharged, 375 kW at 1800 rpm (80/1269 EWG - fan loose). Max. torque: 2400 Nm at 1300 rpm. Fuel tank capacity: 400 l. Engine emission: EUROMOT / EPA / CARB Tier 4i (non road). Transmission Mercedes G 240-16 with EPS (Electronic Pneumatic Shifting), 16 forward and 2 reverse speeds. Transverse differential locks. Two speed transfer case with inter-axle differential lock.. Brakes Service brake: pneumatic dual circuit, acting on all wheels, air dryer. Anti-lock braking system (ABS). Permanent brake: exhaust brake and constant throttle brake. Parking brake: pneumatically operated spring-loaded brake acting on axle lines 2, 3, 4 and 5. Cab 2-man-design, safety glass, driver and passenger seat with hydraulic suspension, engine-dependent hot water heater. Complete instrumentation and driving controls.